We've got picks for the first week of Junesploitation and some non-Junesploitation picks if you're not into that kind of thing. June 1 - Cops! : Hollywood Homicide (2003, dir. Ron Shelton) – An extremely watchable action comedy featuring the 100 mph fastball of grumpy Harrison Ford performances. June 2 - Slashers! : Never Sleep Again (2010, dir. Daniel Farrands/Andrew Kasch) – A documentary about the Nightmare on Elm St. series that I might enjoy more than any individual movie in the series. Be warned: it’s four hours, but the time flies. June 3 - Troma! : The Toxic Avenger (1985, dir. Lloyd Kaufman) – I'm not much of a Troma guy (sorry Patrick) but this is what I’ll be watching on June 3rd. So, do the same? June 4 - Ninjas! : Ninja 2 (2013, dir. Isaac Florentine) – Good action, good Adkins. His wife just wanted black thunder chocolate. June 5 - Serial Killers! : All the Boys Love Mandy Lane (2006, dir. Jonathan Levine) – Not a great movie (in fact it’s just average) but certainly interesting and disorienting. Mandy Lane features an awfully pretty Amber Heard (I guess I understand why all the boys would love her) and one of the most painful looking death scenes ever. If you are going to jump off a roof into a pool, make sure you are going to get to the pool! 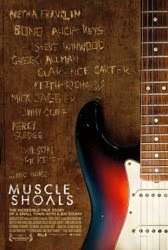 Heath Holland: Muscle Shoals (2013, dir. Greg "Freddy" Camalier) Muscle Shoals is a little town in northwestern Alabama, near the borders of both Mississippi and Tennessee, where some of the greatest songs in rock and soul were recorded. Because it sits at the crossroads of blues and country music, Muscle Shoals was situated in a perfect spot for the musical revolution that happened in the late '50s and early '60s. A bevy of musicians, from Aretha Franklin and Percy Sledge to Mick Jagger and Keith Richards, appear in interviews to discuss the mystical nature of the deep south and the contradictions that give it an energy not found anywhere else. The documentary also chronicles the struggles of the civil rights movement in Alabama during the '60s and how the tensions that existed outside the studio led to the creation of some of music's most legendary records inside of it. Any stories that are revealed during the documentary (like Jagger and Richards doing drugs in the bathroom while recording "Wild Horses" or how Aretha Franklin's "Respect" finally found its groove) are just icing on the cake. 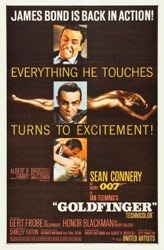 JB: Goldfinger (1964, dir. Guy Hamilton) My favorite James Bond film, available anytime you want to watch it on Netflix Instant Streaming. Heath Holland doesn't realize it yet, but when we meet up tonight at Wonderfest in Louisville, Kentucky, I am going to try and act out this film in the hotel, with me as Auric Goldfinger and Heath as James Bond! I can't wait. I will try to shoot him in his bathroom, try to cheat him at golf, try to decapitate him with my razor-brimmed bowler hat, try to strap him to a platform and point a laser between his legs, and finally try to handcuff him to an nuclear bomb. "No, Mr. Holland, I expect you to DIE!" June 1 - Cops! : Dead Heat (1988, dir. Mark Goldblatt) I just talked about this action comedy starring Treat Williams as a zombie cop trying to solve his own murder on the Bad Horror We Love podcast with Heather Wixson. Joe Piscopo tries really hard to be the comic relief, but Williams won't let him have it. His deadpan sarcasm owns the movie. This was written by Terry Black, Shane Black's brother. It will also work for Zombies! (June 16), '80s Horror! (June 19) and '80s Action! (June 26). It's the gift that keeps giving. June 2 - Slashers! : Halloween: The Curse of Michael Myers (1995, dir. Joe Chappelle) This movie is mostly terrible, but it does feature a) a person exploding from electricity and b) Paul Rudd's first/worst performance. Heavily edited by Miramax, you should catch up with it now before you drop $120 this September to buy the Halloween: Complete Collection Blu-ray box set just so you can own the long-bootleged "Producer's Cut." Or you can watch A Nightmare on Elm Street 2: Freddy's Revenge, the gayest horror movie ever made. June 4 - Ninjas! 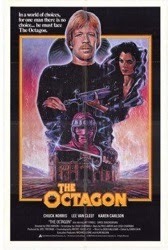 : The Octagon (1980, dir. Eric Karson) I'm a huge #HeavyAction fan, but I don't love Chuck Norris. Still, this is one of his better outings and one of the first American movies to prominently feature ninjas in the plot. Also works for '80s Action! (June 26). June 5 - Serial Killers! : Henry, Portrait of a Serial Killer (1986, dir. John McNaughton) This is a tough one to recommend, because Junesploitation is usually about watching crazy movies and having fun. There is nothing fun about this movie. It's gruesome and VERY hard to watch. It's also really good. Just know what you're in for. Or you could watch last year's Maniac, director Franck Khalfoun's first-person POV remake of Bill Lustig's original. It's technically impressive and has a cool score but I wasn't crazy about it. Mr. Riske...will you marry me? Not trying to c-block Adam's recommendation/proposal, but AHEM. He's all yours Patrick. 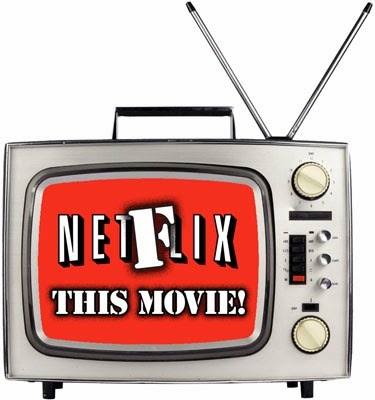 It's tough because we've recommended everything on Netflix already. I still really care Matt but Patrick is going to make the better homemaker. I stand corrected, Mr. Bromley...though I am still correct about you guys having great taste, as your Hollywood Homicide appreciation proves. I honestly think provincialism killed that film at the box office. Some of it plays so true to real life in LA that it's damn near like watching a documentary. That whole Andre 3000 read-my-script scene has played itself out in my life more times than I care to remember (though sadly never with Andre 3000 actually involved).